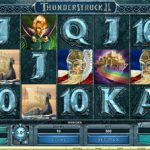 Thunderstruck II is without a doubt one of the most popular and most powerful video slot games coming from the rich Microgaming portfolio. 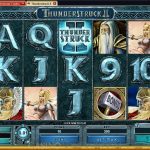 This slot has the potential for life changing payouts, which is the main reason why Thunderstruck II is a personal favorite for many Microgaming fans. The wild symbol in Thunderstruck II will substitute for all symbols except the scatter and will also double any payout he contributes in. The scatter symbol in the slot is the Hammer and three or more of them grant you access to the Great Hall of Spins. Here you have four different free spins features and each one is unlocked after you trigger the previous feature four times. Valkyrie awards 10 free spins where all payouts are multiplied by x5. The free spins can be re-triggered. Loki will award 15 free spins with the Wild Magic Feature. If the Wild Magic symbol lands on reel 3 he will award extra wilds on the reels. Here 2, 3, 4 and 5 scatters award 1, 2, 3 and 4 extra free spins. Odin will award you with 20 free spins and the Wild Raven feature. On each winning spin the ravens will land on the reels awarding one or two wilds with a x2 or x3 multiplier. The last free spins feature is Thor who awards 25 free spins with Rolling Reels. Each consecutive win on the reels awards a multiplier of x2, x3, x4 up to x5. The slot also has a random Wild Storm Feature. Thor will land on the reels and shoot lightning down. Each lightning will award a Wild Reel. Players can win up to five Wild Reels on the screen. 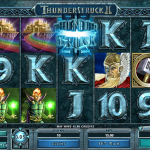 Thunderstruck II is one of the best online video slots in the world coming from Microgaming. It can pay massive amounts of money which is reason enough to try the slot for real play. Fantasy world, forgotten land, if that’s something you like consider playing The Forgotten Land Of Lemuria a 5 reel slot by MicroGaming.